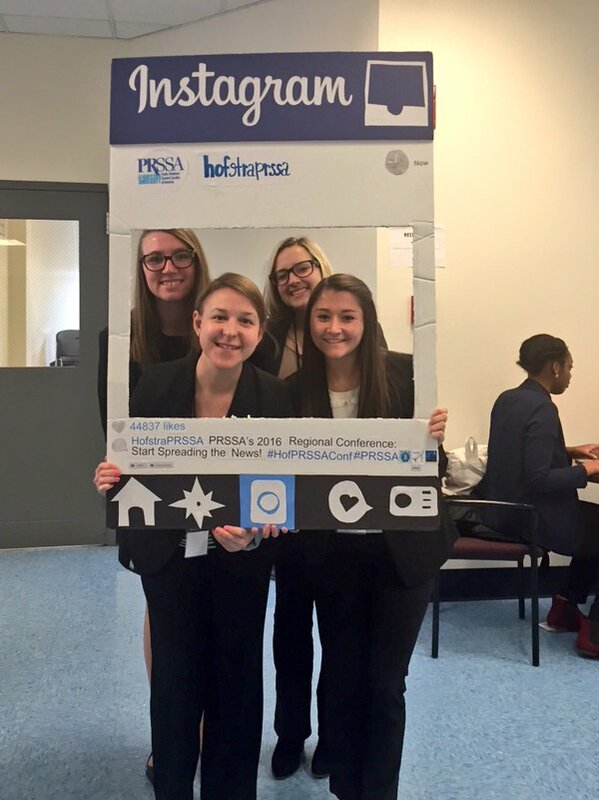 This past weekend, four members of Penn State PRSSA traveled to Hofstra University in Long Island, NY, for the 2016 Regional Conference. The Hofstra Regional Conference: Start Spreading the News, provided a variety of panels for public relations students and gave new insights into various industries in the PR world. The Hofstra Regional Conference was filled with enlightening breakout sessions, networking events and memorable moments. The Welcome Mixer at the Empire State Building kicked off the weekend and gave Penn State’s chapter of PRSSA the opportunity to network with students from other universities in the area and industry professionals alike. Looking back on the entire conference, my favorite part was the Entertainment PR session I attended with fellow Penn Stater Emily Pirt on Saturday morning. The session was structured in a panel format, with four panelists who worked with motion pictures, radio, event planning, and at Madison Square Garden! Most of the panelists were Hofstra alumni who had a few years experience with PR in the entertainment industry. The speakers, Sophia, Jessica, Danielle and Andrea all had their own unique perspectives on the industry and how to breakthrough in such a competitive field. They could all agree on the unpredictability of entertainment PR and how if you want to enter into the industry, you must be a great spur of the moment decision maker! This weekend, three fellow executive board members and I were able to adventure through New York to hear from PR professionals and meet other PRSSA chapters at the Hofstra University Regional Conference: Start Spreading the News. After Friday evening’s kickoff reception in the Empire State Building where we networked with agency experts, we began our day early on Saturday for some exciting workshops. My personal favorite, “Como Se Dice PR? : Public Relations in the Spanish Market,” gave us the opportunity to ask panelists Luis Montes, Vanessa Mota Rosado and Carolina Rincon Sato about communication across cultures in the Spanish market. They stressed the importance of crafting a message specific to your audience – something we should remember not only in communicating across cultures, but also in everyday business. Before packing up for the drive home, we also squeezed in time for a headshot session and lunch break for more networking opportunities with the guest speakers. All in all, Start Spreading the News was a huge success! Besides the awesome networking opportunities and endless professional insight, my favorite part of the Hofstra Regional Conference was the panel discussion on the technology PR industry. Admittedly, I was a little hesitant about attending the session because I’m not the most tech-savvy person in the world. However, the speakers did an excellent job cutting through the jargon and explaining their day-to-day. I appreciated all of the speakers’ insight into the industry and hearing about their personal experiences. As it turns out, the majority of them didn’t pursue a career in tech PR…it just happened! The biggest takeaway from the panel was to not be intimidated by the industry; technology is a field where you can learn quickly on the job and familiarize yourself with the subject matter quite easily. Technology is such a booming industry, and future PR professionals shouldn’t dismiss tech PR opportunities, especially if there is an interest in crisis communications. While crises can happen with any type of client, the ever-changing world of tech has made dealing with issues like information leaks, app crashes, etc. commonplace. The panel gave students the chance to hear from panelists, A.J. Fox, Sherry Goldman, Vesna Jaksic Lowe and Katharina Plumb, who are all public relations professionals working alongside non-profits across various levels. One of the main messages that the panelists all stressed was the importance of being an effective storyteller. With so many nonprofits focusing on human rights, finding a way to grab the public’s attention through outstanding storytelling is essential. “The issues we and our clients cover are sometimes very brutal and can be a harsh reality for the public to face,” said Vesna Jaksic Lowe, deputy director of communications at Physicians for Human Rights. “Your job as a communicator is to find ways to make people care about such brutal issues.” According to panelist Vesna Jaksic Lowe, during her time as a reporter, it only took her 30 seconds to decide if a press release was newsworthy. Overall, the message I took from this panel was that creativity and a well-written story can go a long way. An effective storyteller is one that’s able to see a story from a variety of angles, not just one perspective!